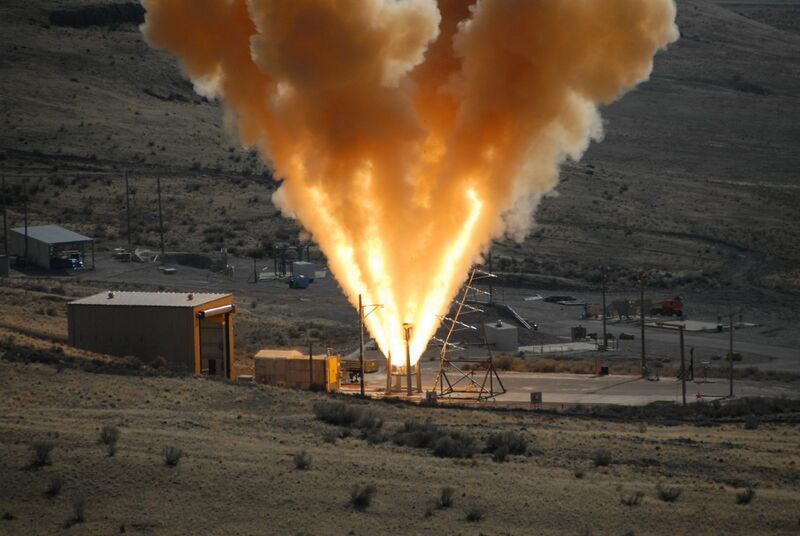 PROMONTORY, Utah — On Thursday, June 15, 2017, NASA, Orbital ATK, and Lockheed Martin are slated to carry out the first of three qualification ground tests (QM-1) of the Launch Abort Motor being developed for use on the space agency’s Orion spacecraft. The vertical ground test firing is slated to take place at 1 p.m. MDT (19:00 GMT) at Orbital ATK’s test facility located near Promontory, Utah. In the event of an emergency either at the launch pad or during ascent, Orion is fitted with a Launch Abort System, or “LAS”, that would pull Orion’s Command Module away from the vehicle’s Service Module as well as the Space Launch System (SLS) rocket it is attached to. The 17-foot (5.2-meter) tall Launch Abort Motor set to be tested is the main motor in the escape system and has a diameter of about three feet (1 meter). It has a manifold that has four nozzles and turns the flow of the flames to create a pulling motion. Thursday’s test is scheduled to last for only about five seconds. However, it will be an impressive five seconds with the motor reaching 400,000 pounds-force (1,800 kN) of thrust in just one-eighth of a second, sending plumes some 100 feet (30 meters) into the desert sky. During an actual abort scenario, either on the launch pad or up to 300,000 feet (91,000 meters) in altitude during the vehicles climb toward orbit, the motor would pull the Orion spacecraft’s Command Module away from whatever event would require a hasty retreat away from the launch vehicle and spacecraft. For this test, the abort motor was fitted onto a specially-designed vertical test stand with the nozzles pointed skyward. When activated, the plumes of fire and smoke will shoot into the sky. The motor is currently on the test stand, which has temporary thermal panels between the motor’s four legs to better regulate thermal conditioning, which was initiated on Sunday, June 11. The panels will be removed a few hours before the test. 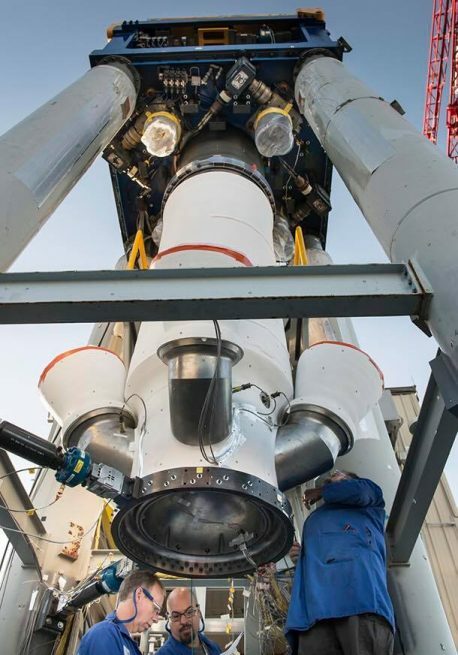 Once this has occurred, Orbital ATK’s engineers will erect the heat shield acoustic array above the motor and perform final instrument checks for the test firing, according to a statement provided to SpaceFlight Insider by Orbital ATK. If everything continues to go as NASA and its family of contractors plan, the SLS will conduct its maiden flight from Kennedy Space Center’s Launch Complex 39B in 2019. It will send an Orion spacecraft on a circumlunar journey designed as a shakedown flight before sending crews aloft on the rocket in 2023. NASA looked into the possibility of having a crew fly on the 2019 inaugural flight of the SLS, as part of a directive from NASA’s Acting Administrator Robert Lightfoot. The space agency, however, opted to maintain the current path it was on as there were too many logistical and technological elements that would not support a human flight under that timeline. An Orion spacecraft has already conducted one uncrewed flight, atop a United Launch Alliance Delta IV Heavy rocket on Exploration Flight Test 1 in December of 2014. Those wishing to watch the test can go to a public viewing site along State Road 83 North (about 20 miles west of Corinne, Utah). Updated at 2 p.m. EDT, June 14, to clarify the maximum altitude the Launch Abort Motor can be used during ascent. Is there a mistake? 300,000 feet is about 57 miles. That’s a pretty impressive abort motor if it can haul the Command Module into space from the launch pad. Per Orbital ATK: The abort motor’s function is to pull the crew capsule to safety in an emergency situation on the pad or during launch, up to 300,000 feet in altitude. Couldn’t such tests, as well as nuclear tests, be the reason for the earth changing its orbit and climate? Interesting question. Given the general mass of the Earth and the volume of the atmosphere? It’s highly unlikely the test firing of this small engine for five or so seconds will have an appreciable impact on either Earth’s orbit/climate.